Rebel Wilson makes a funny, sardonic heroine in a movie where much of the fun is in picking out the rom-com homages. Rating: 3 stars out of 4. If real life was like a romantic comedy, all rooms would feature flattering lighting and well-chosen bouquets; all streets would be lined with cutely named cupcake shops and bridal ateliers; and all of our co-workers would have perfect hair, whimsically chosen outfits and snappily scripted repartee. I’m not sure I want to live in this world (though, for the record, all of my Seattle Times colleagues are adorable and I would absolutely watch a rom-com set in our newsroom), but decades of movie-watching have shown me that it’s a lovely place to visit; the predictability is part of the charm. Much of the fun of “Isn’t It Romantic” is picking out the rom-com homages (Natalie leaves the hospital in an outfit exactly like one worn by Julia Roberts in “Pretty Woman”) and clichés. Natalie wakes up in the morning with lipstick already on; her apartment is suddenly transformed into one wildly beyond what she could afford; impromptu musical numbers break out. (“How did everyone know the choreography?” asks a puzzled Natalie.) It’s a lot of concept, but director Todd Strauss-Schulson keeps things moving quickly, and wraps it up before the 90-minute mark. Wilson, usually a wisecracking supporting player, makes a funny, sardonic heroine, though I wish she hadn’t had to endure a learning-to-love-yourself moment near the end. Adam Devine is agreeably generic as her office-pal-who-not-so-secretly-loves-her, and Liam Hemsworth steals the whole thing as a handsome client turned fantasy boyfriend, who writes down his phone number on flower petals and is prone to dizzy little pirouettes of joy when she’s near. “Oh my god,” sighed a young woman near me, as he swoonily appeared for a romantic first date with Natalie, suit impeccably fitted and eyes a-twinkle. “Isn’t It Romantic” both spoofs rom-com conventions and embraces them; it’s a tricky balance, but it doesn’t fall off the wire. 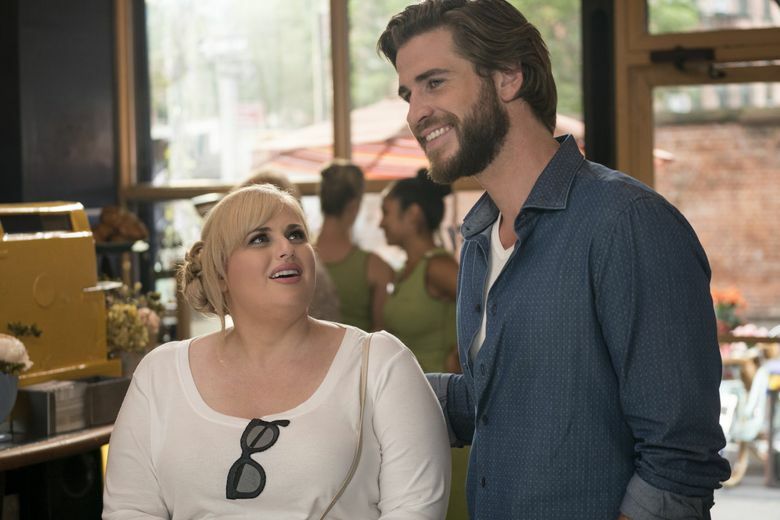 ★★★ ”Isn’t It Romantic,” with Rebel Wilson, Liam Hemsworth, Adam Devine, Priyanka Chopra. Directed by Todd Strauss-Schulson, from a screenplay by Erin Cardillo, Dana Fox and Katie Silberman. 89 minutes. Rated PG-13 for language, some sexual material and a brief drug reference. Opens Feb. 13 at multiple theaters.